Jvc mostly targets very specific markets and I"m sure that for those people it will be a perfect camera. Will it be something with integrated data modems for bonded streaming that you can simply pop a couple of SIM cards into? (Now think about how rapidly that is going to get outdated). But it could be a further development to the HM650 which was a model that JVCKenwood touted its network capabilities among its top selling features. Going for workflow efficiency rather than chasing pixels. The picture if definitely a shoulder camera with at least one wireless slot in receiver hole...the thing in back, maybe some sort of modem, but I do not see JVC making it's own slot in modems. 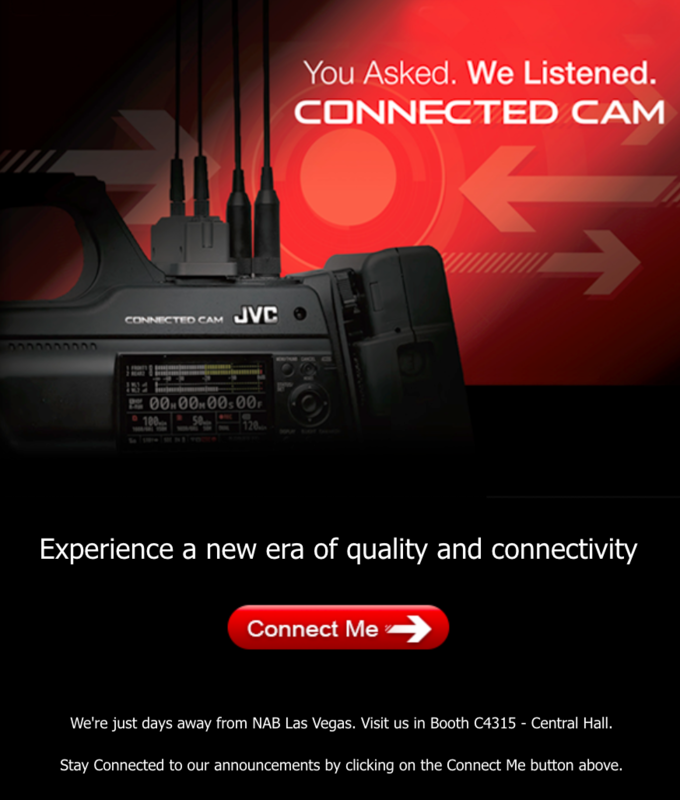 Didn't they show mockup of a 4K shoulder camera at NAB 2014 that ever materialized? WAYNE, NJ (March 29, 2018) – JVC Professional Video, a division of JVCKENWOOD USA Corporation, today announced Televisa, the largest mass media company in Hispanic America, has purchased 25 JVC ProHD Wireless Bridge bonded video-over-IP units to transmit live ENG field reports from 21 different markets throughout Mexico. The first unit was tested last year at XEFB in Monterrey; now, there are three Wireless Bridge units at XEFB and three at XHG in Guadalajara, with the rest assigned to 19 other Televisa Regional stations….. It's been a while since JVC has had any product in this form factor with wireless receiver slots. Hopefully build is still cast alloy construction... with the weight spec it certainly seems so. First thoughts are... OLED viewfinder and list price point! The resolution of the viewfinder at 854x480 is kinda meh however, in light of the display technologies available today - even on consumer products. Also wondering if the side display is switchable between data and video preview (like the Sonys) or maybe a combination (video with super text). Bonded LTE Bridge accessory is still an external box as a Gold-mount sandwich device. The inclusion of a MPEG-2 35Mbps codec seems to acknowledge the fact that many news workflows still run on that standard, even in today's prevalence of 50Mbps 4:2:2. No h.265 HEVC on the other end of the spectrum, for recording or streaming. 37 watts max power consumption... I'm gonna say is kinda high for a solid-state camcorder with no mechanical deck or tube viewfinder. Perhaps this is full on streaming and record and proxy and wireless slot at the same time, hopefully. 209Whr packs are readily available though. Details sparse on this function from publicly available specs, but it appears the 3G-SDI input is for return viewing only, not recording or streaming. 3G-SDI output: wondering if it is level a or b, and whether you can set clean feed on one and another with superimposed data, same with the HDMI out - some models all digital outputs are configured with the same parameters. USB Host: can this be used as a recording medium, or only to export proxies / clips, or only to backup settings and firmware updates? I remember JVC made a model a while back that could do internal graphics too. Noticed the audio level dials are towards the rear of the camera. When the camera is on your shoulder reaching these dials will be almost impossible. Audio level dials should be toward the front of the camera. I have always hated the older JVC front audio dials...in the dark i can never feel them or tell what direction to turn them. The big Sony's are not much better. Maybe if the next to cheek side panel dials used for earphone monitor and alert volume were turned into audio level control on all these cameras, it would work better. DV Info Net got some video of it at JVC's booth. Looks like the side display does switch to a video preview. Good additional info and actually the first proper view of the other side of the unit since all the high resolution images supplied by JVC so far only have the left side. It seems like the plug-in receiver is a DB25 style Unislot based on the Lectrosonics adapter plate. Also I notice a menu dial on the viewfinder (which is different than the ones shown in the press release photos), is that to drive the same camera menu or does the viewfinder have a menu structure of its own? Are they still going to offer a CRT viewfinder option for those that prefer that style? The rep mentioned that they are working on slot-in bonded cellular, as opposed to the gold mount sandwich style they show on the website. Has anyone seen or conducted any tests with the 900 yet? The Google machine turns up a few brief looks at it, though I haven't seen any footage at this point. I've got a loaner in my possession, shot some 720p60 ENG night footage, then switched to 1080p60 10 bit 4:2:2 HLG and shot some HDR clips. The camera picture quality is very impressive. It is extremely sharp and smooth at 0 level detail 1080p and 720p. Color is very good, no weird green color hue shift like big Sony's or older 1/3" JVC's. The camera I am testing has the garbage Canon KJ20x8.2KRS lens. Here is the HLG footage converted to HDR10 for those who can view that on their phone or HDR 4K TV. I didn't do much of anything to the settings other than bring them all to default, and set W/B to preset 3200k.